In Chinese History, The Three Kingdoms era (220-265 A.D.) is the time of Civil Wars, Buddhism spreading into China, and several historical figures lived including Kwan Gong and Hua Tuo. Buddhism was introduced in 1 A.D., but did not spread until the Han Dynasty collapsed. Wei Kingdom was the strongest of the three and captured the Shu territory in 263 A.D. The Three Kingdoms period was one of the bloodiest in Chinese history.Throughout the Three Kingdoms Period, battles between the three countries were countless. Among those, battles between Shu and Wu fighting for Jingzhou, Shu and Wei fighting for Hanzhong as well as Wei defeating Shu were all illustrious ones in Chinese history. Finally, the end of the Three Kingdoms Period started from the Sima Yan (son of Sima Yi and chancellor of Wei)'s usurpation of Wei and the establishment of the Jin Dynasty (265 - 420). 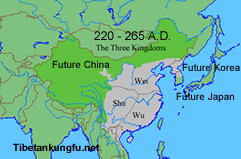 In 282 when the Jin army conquered the last kingdom - Wu's capital, the Three Kingdoms Period was ended. "The middle reaches of the River Yangzi, bordering all three kingdoms, were the inevitable focus of many battles. Before introducing the most famous battle with which the river is associated, it behooves us to first present the three kingdoms and their leaders. 'On and on the Great River rolls, racing east. As right and wrong, pride and fall turn all at once unreal. To blaze in the west-waning day."